It is safe to say that when there is more moisture is in the air, the potential for downpours and flash flooding also increases. What is not necessarily straight forward, is if these events are happening more frequently, and dumping more rainfall when they do. The answer is a resounding yes, but what is the culprit? Why are we seeing a second 100 year flood in three years in Ellicott City, Maryland, when the west coast is in a moderate to exception drought? It all has to do with local climate, and its response to a global increase in temperatures. As temperatures warm, air expands and is able to hold more water. For every one degree of warming, the air’s capacity for water vapor goes up by about 7 percent. The warmer temperatures also dictates how fast and efficient evaporation occurs. Just like if a pot of water is boiling on a stove, the higher the temperature, the faster the water boils, and the faster the water will evaporate and leave the pot to go into the air. The more evaporated water in the air, the more water there is to condense into rain. 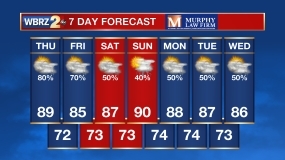 Regions receive differing amounts of rainfall, as a one-inch downpour is unusual in Phoenix, but is much more common in Miami. 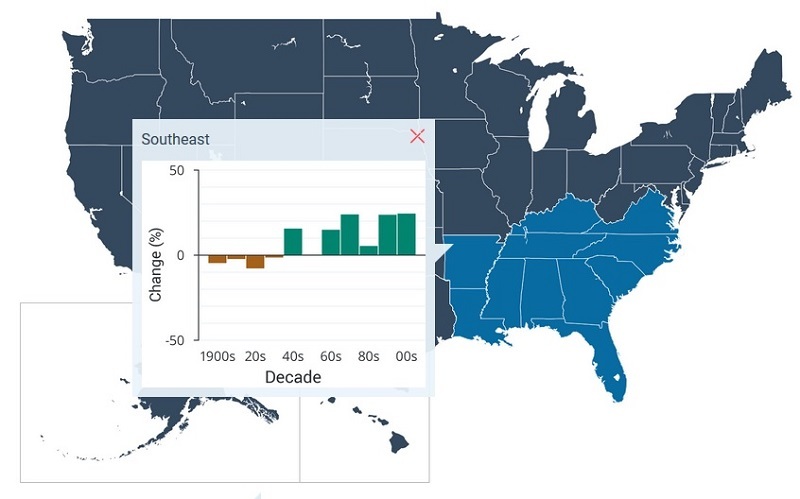 It has been documented that every region of the CONUS has experienced extreme variation in precipitation, but when a 1-3 inch rain event occurs, it happens much more frequently than it did 50-60 years ago. Extreme One-Day Precipitation Events in the Contiguous 48 States, 1910-2015. This shows the percentage of the land area of the contiguous 48 states where a much greater than normal portion of total annual precipitation has come from extreme single-day precipitation events. The bars represent individual years, while the line is a nine-year weighted average. One measure of a heavy precipitation event is a 2-day precipitation total that is exceeded on average only once in a five-year period, also known as a once-in-five-year event. 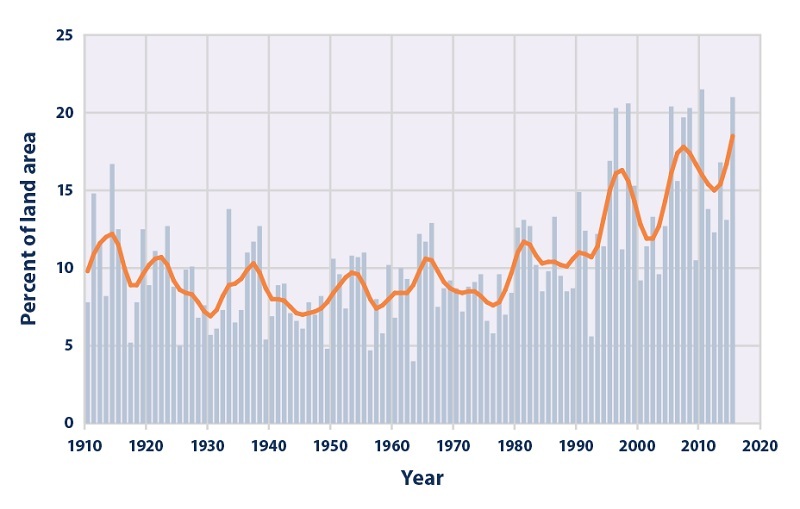 As this extreme precipitation index for 1901-2012 shows, the occurrence of such events has become much more common in recent decades. Changes are compared to the period 1901-1960, and do not include Alaska or Hawaii. The 2000s decade (far right bar) includes 2001-2012. Data Credit: Kunkel et al. 2013. 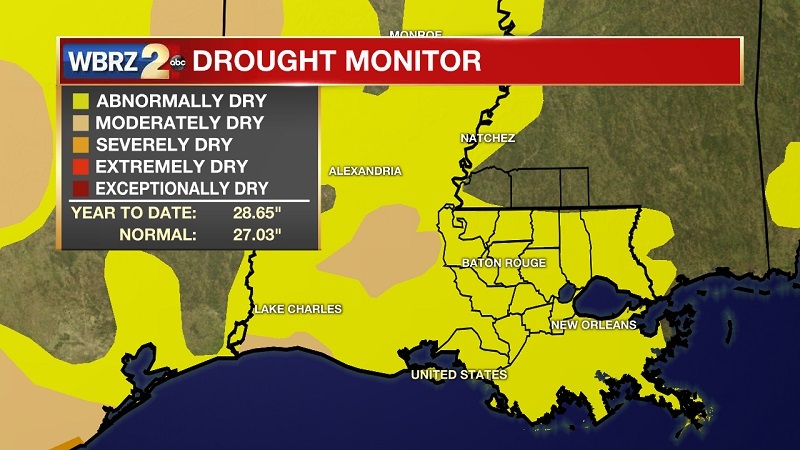 The majority of Louisiana is currently in the Abnormally Dry to Moderate Drought category, even though we are in a surplus for the year. This is the result of experiencing the majority of that moisture earlier in the year, and the very dry month of May. As we break down the rainfall events this year, we observe spans of dry and wet periods. The month of January was exceptionally wet, but we received 4.49 inches on the 27th, which was 63% of the total amount of rainfall that fell in the month. Over the last 6 months, this percentage varies from 26% - 63%. This means that our wettest day each month amounts to at least a quarter of the rainfall we are supposed to receive over 30 days. Drought monitor on June 13, 2018. 28.65" of rainfall thus far in 2018, and is a yearly surplus of 1.62" even though our region is categorized as Abnormally Dry. A look into the precipitation amounts received monthly, and the corresponding day which received the highest amount of rainfall in Baton Rouge. 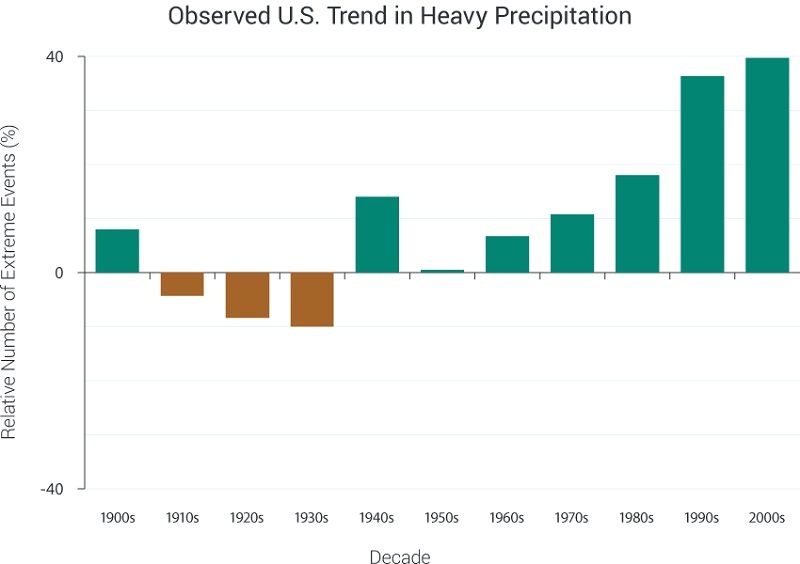 Percent changes in the annual amount of precipitation falling in very heavy events, defined as the heaviest 1% of all daily events from 1901 to 2012 for each region. The far right bar is for the 2001-2012. In recent decades there have been increases nationally, with the largest increases in the Northeast, Great Plains, Midwest, and Southeast. Changes are compared to the 1901-1960 average for all regions except Alaska and Hawaii. Obviously, the main concern with an increasing number of heavy downpours across the nation, is an increased threat of flooding and property loss, but other issues will arise. Landslides, avalanches, microbursts, will all occur more frequently, as maintaining crops will become increasingly more difficult. It is important to note, that there are some ways we can help to mitigate these issues. Preparation is key, both on a personal level and on the local, state, and federal government level as well. Allotting funds for flood warnings, construction of flood defenses, protecting wetlands, restoring and maintaining river channels, building water storage areas, and atmospheric moisture maintenance can all alleviate the hazardous impacts of increased heavy downpours.